Juergen Klinsmann picked his preliminary 30 for the World Cup today and his picks were every bit as controversial--and fun--as we wanted them to me, Julian Green made it after all, but so did Brad Davis. Six of the manager's picks are dual German nationals: Julian Green, Jermaine Jones, Fabian Johnson, John Brooks, Tim Chandler, Terrence Boyd. Great players, interesting pattern. That Julian Green got called in is an underwhelming surprise. We knew he gave him a chance versus Mexico for a reason. That Brad Davjs made it is much more interesting. Is it either or for the final 23? And Joe Corona! A fan-favorite during last summer's Gold Cup, Corona was a bit lost in the shuffle at Tijuana with their new manager. Klinsmann clearly believes in him. Yedlin, on the other hand, is quite a risky move, especially given his performance versus New England this past weekend. Or perhaps he was already dreaming of Brazil? Pretty much called it a month ago. Wondolowski is the token poacher, Altidore is the golden boy, Johannsson is the new guy and Terrence Boyd picked up his game lately. Timmy Chandler made it in after all. 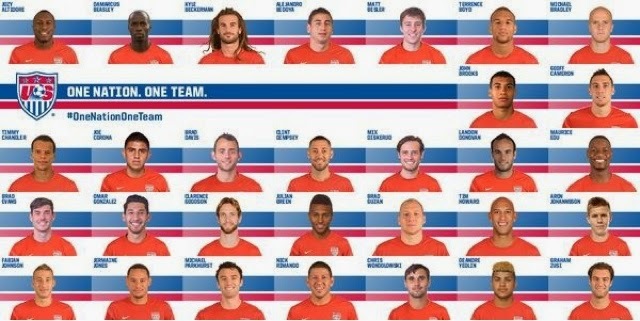 Klinsmann is not one to ignore commitment on the pitch and he wants all weapons available to face the group of death. Chandler can man both flanks and so can Fabian Johnson. Will it be the duo that failed as flankers in Honduras? Agudelo missed out. And he will be missed. In truth, the former Red Bull has done more for himself via scoring than any other forward except Boyd. But would you risk leaving Wondolowski or Johannsson out? Boyd had made a a case with his late season goals so he was going to be in this group regardless. Mike Magee also misses out, but his age and failure to impress internationally certainly played a part. No Eddie Johnson. A bit of a head-scratcher, but given EJ's struggles lately, it may not be that bad an idea. Perhaps it's time for the baton to be rescinded to the youngsters. Tim Ream has not played lately for the National Team, nor has Brek Shea. Danny Williams missed the cut due to a crowded midfield. Jack McInerney will have his chance later on, as will, possibly, Zelalem. Landon Donovan, Michael Bradley and Clint Dempsey are back. They were the core of the midfield in 2010 and also scored all of the goals. But how will they be deployed this time? Together? Certainly Graham Zusi is there for a reason. In the end what counts with the trio is experience. no one knows a World Cup better than Donovan, and although he's not that young, he's also not that old. Dempsey is a star Stateside and so is Michael Bradley. Major League Soccer is their playground and they come to represent.